OGDEN, Utah – The effect of technology on Americans’ emotions and social lives will be examined during the Weber Historical Society Lecture Series April 15 at 7 p.m. in Weber State University’s Hurst Center Dumke Legacy Hall. 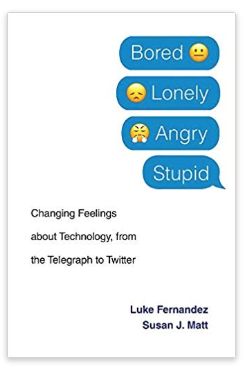 WSU School of Computing assistant professor Luke Fernandez and history professor Susan Matt are authors of the book “Bored, Lonely, Angry, Stupid: Changing Feelings about Technology, from the Telegraph to Twitter.” The book examines how technology changes our emotions and redefines our feelings. The authors examined letters, diaries and memoirs from the 19th century to the present. They also conducted interviews with 55 participants from 13 states and the District of Columbia. The presentation is sponsored by the WSU Alumni Association, the College of Social & Behavioral Sciences, the Department of History, Stewart Library and the Weber Historical Society. Visit weber.edu/history/historicalsociety for more information on the Weber Historical Society Spring Lecture Series.